Whitechapel have launched their lyric video for fan favorite song, “Vicer Exciser” on guitarworld.com. 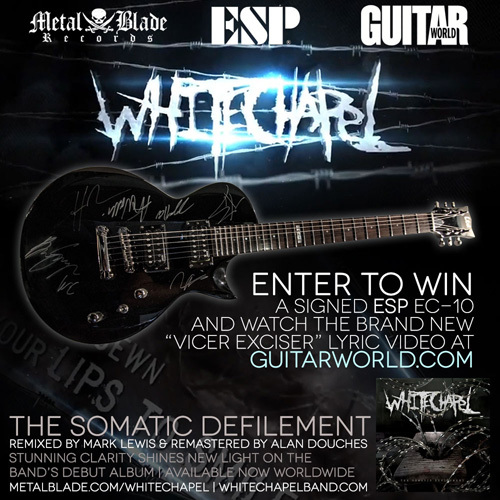 In addition to watching the lyric video, fans can also enter to win an ESP guitar signed by the entire band! Watch “Vicer Exciser” HERE and enter to win now at guitarworld.com HERE. Whitechapel’s debut full-length album, The Somatic Defilement, is the album that firmly planted the band on an upward trajectory that has carried the band to the upper echelons of modern death metal. The band has taken The Somatic Defilement and placed it in the capable hands of Audiohammer Studios producer Mark Lewis for a complete re-mix, along with a re-master by Alan Douches. The results are staggering and give The Somatic Defilement a modern luster up to the standards of the band’s most recent recordings. Fans can listen and order now at metalblade.com/whitechapel. WHITECHAPEL fans can subscribe to vocalist Phil Bozeman’s channel, which focuses on gaming, as well as responses to questions from fans. Subscribe at youtube.com/phillybo1985. Alex Wade’s channel can be found at youtube.com/AlexWadeOfficial. The first video posted was a performance demonstration of WHITECHAPEL’s Vicer Exciser from their re-issue of The Somatic Defilement. The re-issues was completely re-mixed by Audiohammer’s Mark Lewis and re-mastered by Alan Douches at West Westside. The official channel for the band can be found at youtube.com/whitechapeltv. This entry was posted in METAL and tagged Entertainment, Hollywood, Iowa City, macewan hall ballroom, Music, New Orleans, Newport Music Hall, Odeon Events Centre, San Francisco, showbox sodo, Somatic Defilement, Tremont Music Hall, WhiteChapel, Ybor City. Bookmark the permalink.